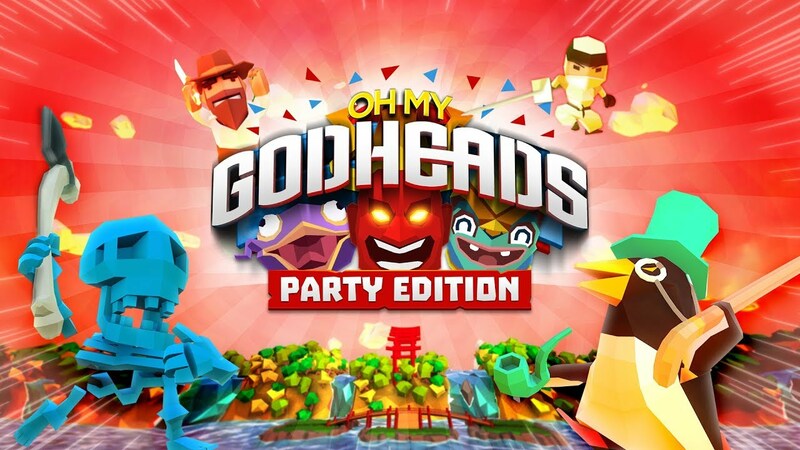 Oh My Godheads: Party Edition, from developer Titutitech as part of the Square Enix Collective for indie game distribution, is an arena-style 1-4 player competitive game that features a clever gameplay mechanic. You use giant heads (of past deities) to score points and are the catalysts for either winning or losing a match. Each of these mystical heads have different properties that provide a unique multiplayer experience, that is as long as you have friends or family to play with. There are ten different godheads based on different mythologies (Norse and Egyptian among them), and as stated before, they all have their own personalities and quirks with some even attacking you or another character. One head might explode if you hold it too long, another will freeze you solid the longer you hold it, while a third one might be too heavy to lift and can only be rolled. Oh My Godheads runs with this concept of using the heads to accomplish goals and succeeds for the most part. Four different game modes are included: Capture the Head, King of the Head, Headhunters, and Last Man Standing. In Capture the Head, you have to, as expected, capture heads and put them on plinths. In King of the Head you only have to hold on to a head for as long as you can while hoping you don’t get one with negative powers for yourself. Headhunters is a free-for-all where whoever gets the most kills wins. Finally, in Last Man Standing you don’t technically have to kill anyone, you just have to be the one that survives the longest. Single players have still been considered in this primarily multiplayer game, and even the multiplayer modes give you the option to pick bot characters. The single player trials are short tasks in the form of killing a certain number of enemies in a time limit, staying alive for as long as possible, killing enemies in particular ways, and other similar tasks. There are 30 in total and the better you perform these objectives, the better the medal you earn. None of these challenges are too taxing, so collecting gold on all of them shouldn’t take you too long. While Oh My Godheads can be played in single-player, I wouldn’t recommend it. The AI isn’t particularly intelligent which makes playing with a computer teammate frustrating. Playing against the AI isn’t quite as bad though, and they still do feel competitive, but they tend to make some head-scratching mistakes, like suddenly throwing the head out of play for no reason other than to drive you up the wall. Pretty much, Oh My Godheads loses a lot of its charm and fun when playing solo in other words. Oh My Godheads features many different levels set in a lot of different places. One match might take place near a waterfall in Japan, while another might be close to a volcano in Italy, via remote tropical islands. All the levels have different types of terrain, as well as different challenges, including rolling boulders, cliffs, traps, breaking bridges, etc. There are also a few characters that you can choose to play as and these choices unfortunately, don’t include much variety as most of the characters play exactly the same without different abilities. I was fond of playing as the adorable penguin in a top hat wearing a monocle though. Visually, Oh My Godheads is very charming, with low-poly environments and characters, bright colors, and a decent soundtrack. The environments are detailed and delivers in providing a few solid hours of goofy and humorous entertainment. The biggest gripe I have with Oh My Godheads though, is that it just gets boring. Once the novelty wears off, there isn’t really anything to elevate this from the hundreds of other party titles on the Switch. It’s too bad also, because it should have been right up my alley playing with my children, but somehow it never manages to rise above mediocrity. Overall, Oh My Godheads: Party Edition has an intriguing and original premise that just grows stale too fast. The charming visuals and clever cast of characters with fun environments never felt enough. Playing against friends and family provided a couple fun hours, but it all just comes apart when playing alone with AI bots. The lack of online play is also unfortunate and any replay value is lost fairly quickly because of this.